Simple and wholesome, also yuri. The shows basic premise is easy enough to swallow and the characters are better developed than your generic slice of life, but the fantasy aspect is very "shallow". There is no real action and the movement of the story is sporadic, but it's still an easy watch and not as cringy as it can appear. The yuri influence is just that, an influence, overall its got some fun moments and can be well thought out. Slice of life cgdct comedy. I like the kind of hijinx that popped up in this one. I was usually entertained and got a couple chuckles each episode. Each character is there own kinda weirdo, and those things just worked here. Nothing ground breaking, and it's not AotS, but I think you'll have fun if you like this kind of thing. Lolis doing mundane things, lightly sprinkled with yuri. Of course there is no plot and it's "not about anything," but anyone watching slice-of-life of any sort shouldn't go in expecting such a thing. The show follows the typical kirara-kei style of a series of vignettes that explore the setting/characters at a casual, unhurried pace, with lots of humor and cuteness thrown in. This show executes the formula particularly well, and the twist is based around the main characters being a mix of humans and vampires who gradually become friends - although the yuri is strong with this series, as pretty much everyone can be read as a lesbian and at least all four central characters have a clear crush/interest/romantic history with another female character. Vampirism is presented pretty realistically, which is to say that the idea of a blood-drinking entity of the night is deconstructed into an existence that doesn't require the death of anything living in order to preserve itself. In this show, vampires live on blood that can be acquired in a harmless, even impersonal (and internet accessible) manner. Many of the more interesting scenes highlight the inconveniences of vampiric weaknesses for everyday life, or deconstruct the dark and sinister imagery of vampires into something with a practical or reasonable explanation. The writer makes plenty of references to other works with vampires and clearly understands the folklore, so even if you hate Anne Rice and Twilight gutting the evil out of your vampires, you can't really say this show reflects a lack of knowledge of vampire mythology. Even so, it also carries that un-demonizing even further, so that vampires aren't even immortals perpetually trapped in their angsty goth phase at this point, but just, well... as mundane and ordinary a person as your next-door neighbor. Sophie is to die for. I love our cute young-looking MC vampire sophie. She's so laid-back and funny. She and Akari compliment each other so well throughout the series. From Akari's obsession with vampires, versus Sophie's twisted ideas of human nature, I was laughing each and every episode. Here's to a season 2 sometime. Somehow this show about dorky vampires manages to be both cute and funny without sacrificing anything. It's fun to watch and each episode is self-contained enough that one doesn't need to rewatch the entire series to enjoy it. It's a comedy, it's funny, and it works. Will it change the anime industry completely? No, it's a seasonal "Cute Girls Do Cute Things" show, but that's nice in its own way. A Moe slice of life with a small twist. Pointless, harmless and cute. 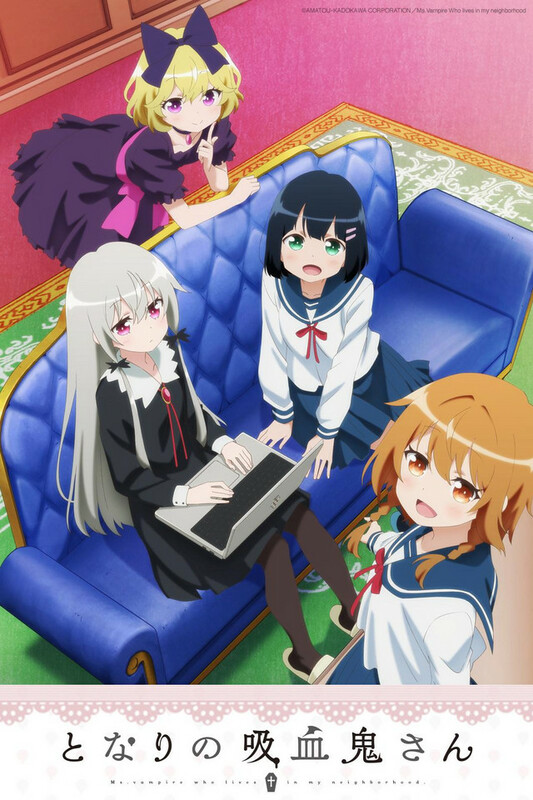 If you don't like moe anime, this show will do nothing to change your mind. Same with slice of life. But if you enjoy either of those, it is a perfectly passable, and enjoyable show of those varieties. The characters are cute, the stories light and pleasant. The show's greatest sins lie not in what it does, but what it doesn't do. The show willingly uses its own gimmick as little as possible and plays everything very very safe. The fact that two of the girls are vampires honestly serves as little more than justification for some one liner jokes and an excuse for their atypical lifestyle. just that, implied, and never goes anywhere. But what it does do, it does well. Things meant to be cute are cute. Things meant to be one liner jokes often work well and can be very funny. Lots of little shout outs to nerds and otaku are very nicely done. You could find much worse anime than this. But you could also find much better. It's a forgettable but enjoyable little show. Moe art style makes all the characters have the same face with different hair and different color eyes. LAZY. I found this show to be cute. I can see where people judge it on being mildly 'yuri' inspired.. but I honestly thing it is cute and feel good. This show was that 'happy' anime I watched every week where things were easy and they were just always hanging out with friends.